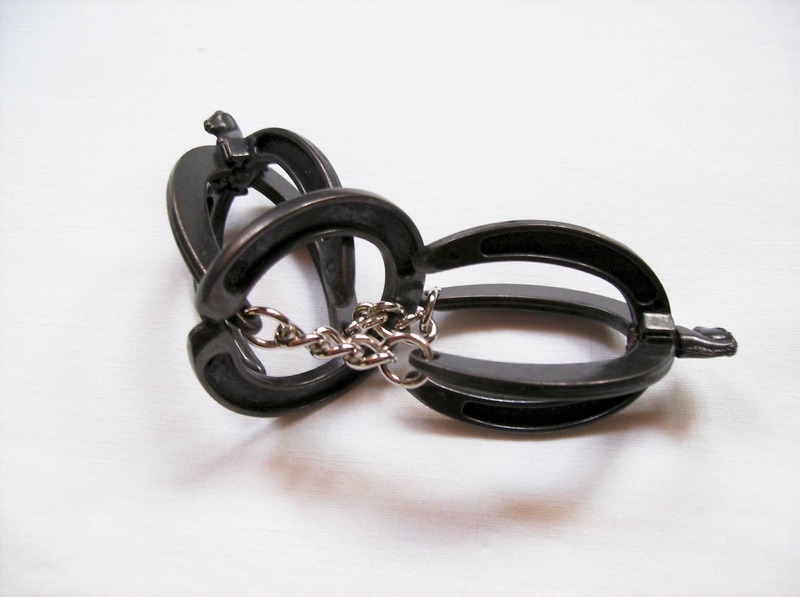 This is the Cast Duet, one of many designs from Oskar van Deventer produced by Hanayama, for the Cast series. It was released together with the Cuby (another one from Oskar) in October 2005. The puzzle is a 3x3 grid with grooves on every square and a ring, which is actually two rings that are bound together by magnets. Your task is to separate the ring in two and remove them from the grid, one at a time by moving them around the grooves, until you find the exit. 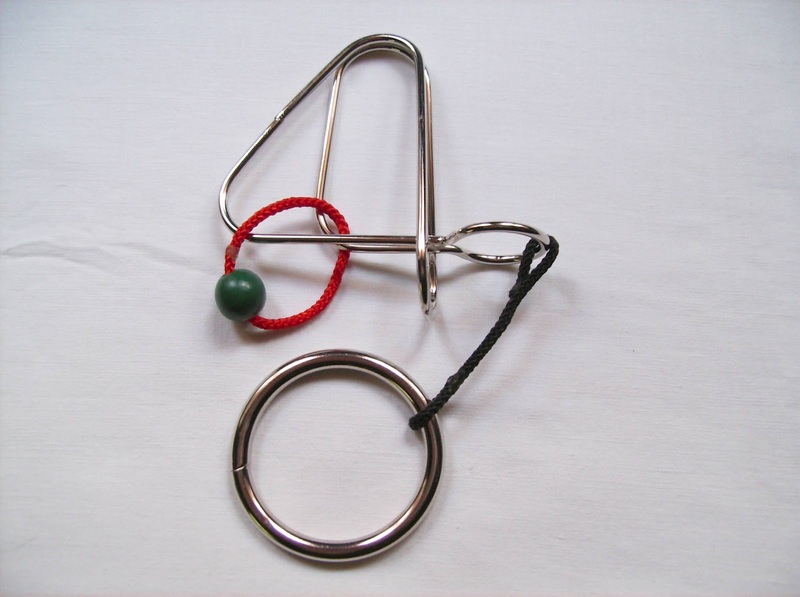 The challenge is similar to the one found in the Cast Bike or the ABC Puzzle, where you have to follow a path full of grooves in order to solve them. This is probably the only Cast Puzzle, at least that I can think of, that has multiple challenges. It's great for replay value, as after you've accomplished the main task of removing the rings and return them to their original position, there are another four challenges, each harder than the last one. You'll notice around the four corners of the center square, small triangles with dots in them (1 through 4), indicating the level of difficulty. These challenges require that you place the rings, joined together, inside those particular square vertices. Below is a picture of the rings in the position number two, the only extra challenge that I solved so far. The Cast Duet is rated by Hanayama at level 5 (out of 6) and PuzzleMaster at level 9 (out of 10), which is no surprise given the high level of difficulty of those harder challenges. The main challenge is somewhat easy enough to get the hang of it, but as you try the extra levels, you'll start to feel the frustration as you try to get the rings across the grid with no apparent result. Sometimes, you might get the rings in the right location, but with the wrong orientation, so you need to start over and try a different path. Solution: Feeling trapped? Get the solution .pdf here. Alternatively, you can click here for a video solution. The Cast Duet is available at PuzzleMaster for CAD $12.95. 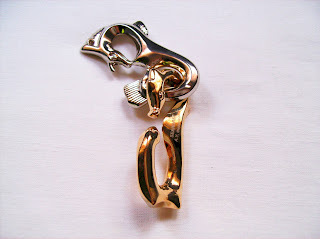 The Cast W-U is another great design by NOB (Nobuyuki Yoshigahara) and was released by Hanayama in 1995. As described on the product information, this puzzle was inspired by the classic Horse (or Horseshoe) puzzle, which had two horseshoes linked by chains and you had to remove a ring from the middle. 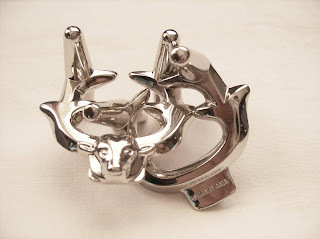 The new design, a bit more complex, has four horseshoes, two overlapping in each end. Since the chains are only linking two horseshoes, that leaves the other two free... In both ends of the horseshoe pair, there's a horse head, which by the way isn't there just by chance: it's a design feature that'll be the key to solve the puzzle. This is a level 3 puzzle, according to Hanayama's rating system (out of 6) and a PuzzleMaster's level 7 (out of 10). As far as solving goes, it wasn't very difficult, maybe because I have solved the Horseshoe puzzle before. Even though it's a bit different to solve, you'll see a certain similarity on the solving process. Don't read the italic text unless you want to know the solution - The trick here is to use the slimmer part of the ring to go down one of the ends of the puzzle, using one horseshoe with the chain and the other just next to it. 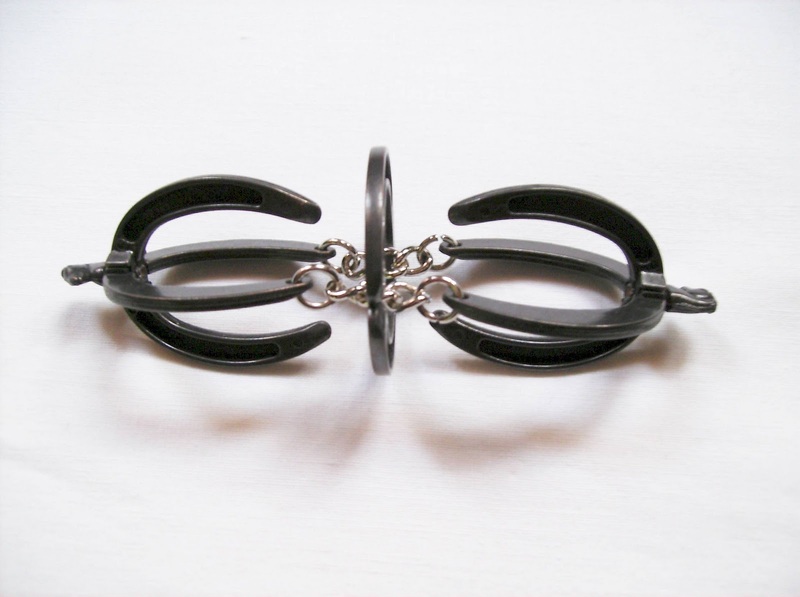 Next, you'll need to pass the ring over the horse head and then you can free it by sliding it down the opposite ends of the overlapping horseshoes that you used before. 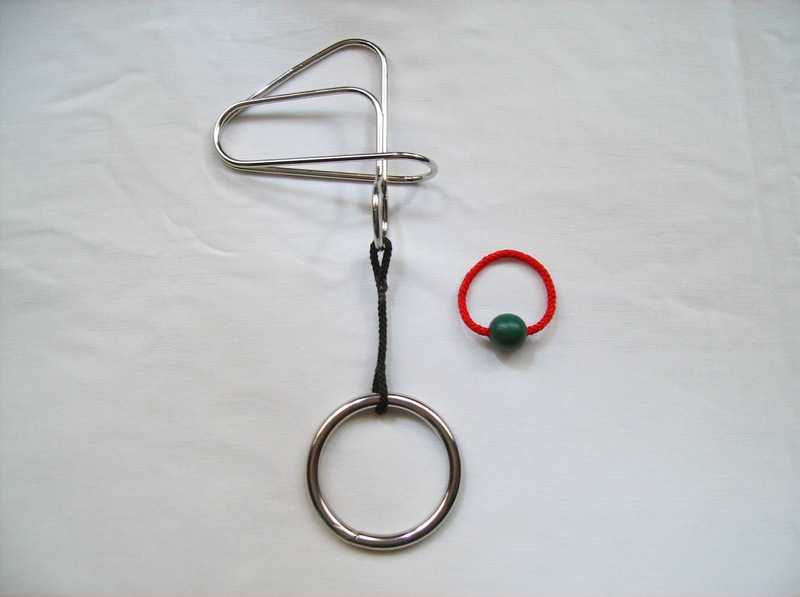 Getting the ring back to its original position is actually easier, because it's not one of those puzzles that you solve "by accident" and once you know how to do it, you can repeat it easily. If you're struggling with it, you can download the solution here. The Cast W-U is available at PuzzleMaster for CAD $12.95. Cast Elk, a concept that's been around since the 19th century and perfectly redesigned by NOB (Nobuyuki Yoshigahara), is one of Hanayama's best in their Cast series. The Cast News is another one of the great NOB's designs. The Elk was the fifth Cast puzzle release by the company, way back in 1986. 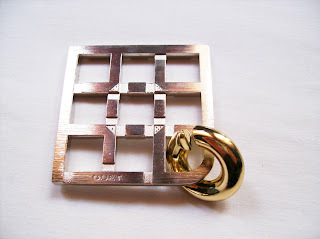 The design is in my opinion, one of the most original ever made by Hanayama. Its appearance is made so that it looks easy to understand, but a pain to solve. 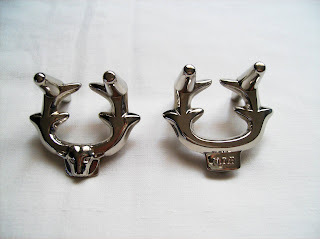 You are presented with two identical pieces depicting an elk's head with its horns. Can you separate them in less than an hour? ...Well, think twice before you underestimate its complexity, as this is probably among the hardest Cast Puzzles around. 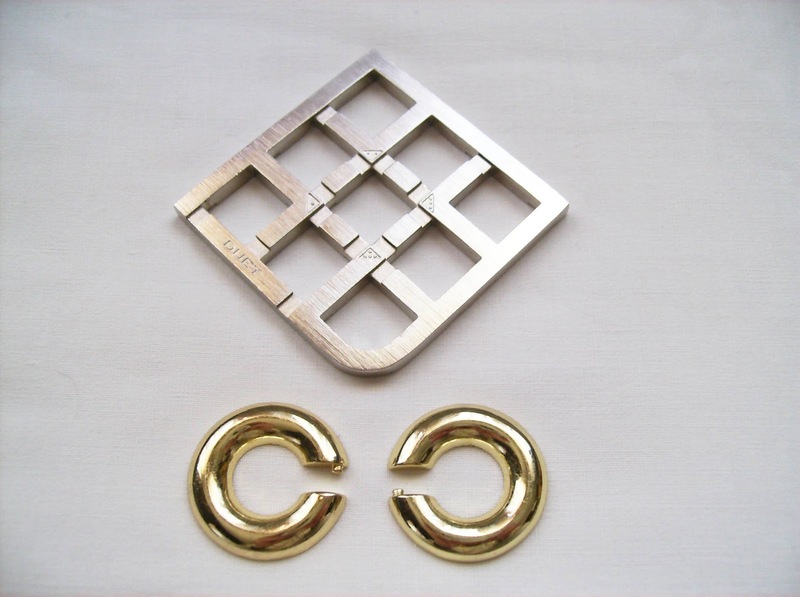 Rated by Hanayama as a level (6 out of 6) and 10 (out of 10) by PuzzleMaster's rating system, you know that you're facing a serious challenge. As you pick it up for the first time, you'll see that most movements are blocked, due to the cleverly placed spikes around the "horns". It's a little hard to explain the solving process in words, also because the first time I solved it, it looked like an "accident" and I didn't know exactly how I got the pieces separated, so repeating it looked like another challenge. Solving time... I would say that since I got the puzzle, I've been trying regularly to solve it and it took me several weeks to figure it out, so I can tell you that if you're persistent with it, you just might solve it in a few days... If you're having trouble with the solution and feel a little impatient, you can check out PuzzleMaster solution here. A simple and yet, beautiful design with a masked complexity, makes this puzzle a must have for any puzzle buff. It will provide you with many, many addictively frustrating hours of head scratching, so what more could you ask for? The Cast Elk is available for purchase at PuzzleMaster for CAD $12.95 (Currently sold out). 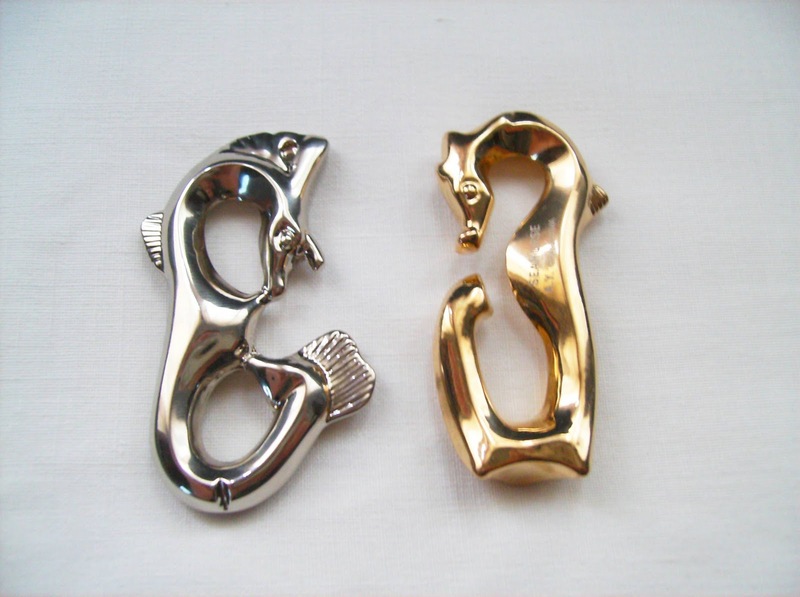 The Cast Seahorse, designed by Akio Yamamoto and released by Hanayama in 2008, belongs to the Marine Series, a special set of 6 puzzles, all with the ocean as the main theme. The Cast Seahorse is one of the most beautiful of this special set, alongside the Cast Starfish. You have two seahorses that are bound together, and you have to carefully disentangle them. There's a silver seahorse with two closed loops and the second, a golden seahorse has two gaps that will work as two open gates to navigate your way across the other one. Wonderful design with the two different colors that adds a nice touch to the overall presentation. 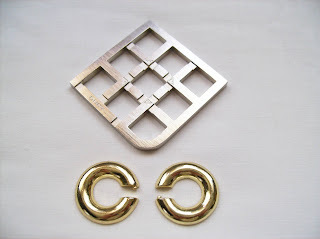 This is a Hanayama level 3 puzzle (out of 6) or PuzzleMaster's level 7 (out of 10). I agree more with the PuzzleMaster's level classification, because it was a bit more challenging than what I was expecting (around 20 minutes solving time). 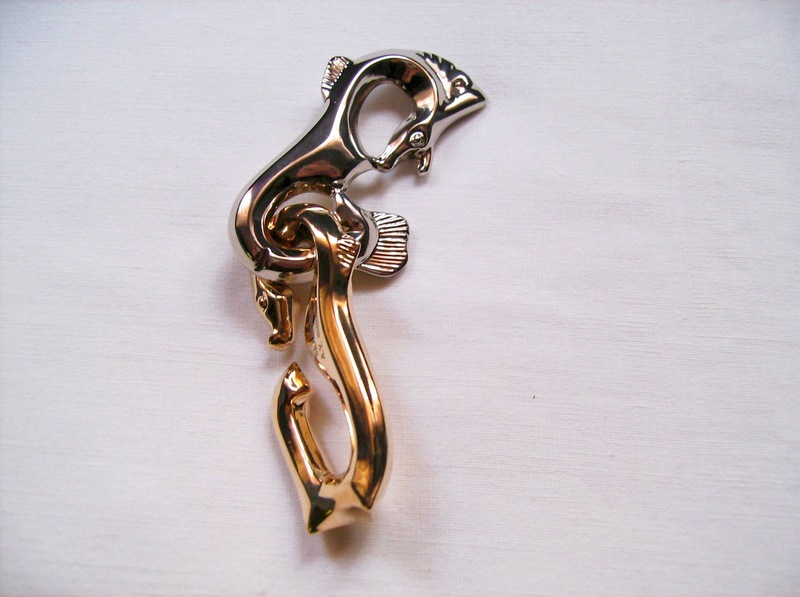 You start with the golden seahorse, hooked by the head to the bottom of the silver one. Your next step is to rotate the golden seahorse to its bottom loop, while still joined at the bottom of the silver one. Next, you have to transfer it to the upper loop of the silver seahorse and you end up separating them at the top by their heads. It's a bit complicated to visualize all this, but for guidance, you can use PuzzleMaster's sheet solution found here. Like most disentanglement puzzles, putting them back together can be a tougher task than to separate them. This is because you spend many time concentrated on how to solve it, that you forget all the steps that were required to successfully disentangle them. So, by the time you achieve your goal, you are so thrilled at that moment to have solved the puzzle, that when you finally try to put them back, it's a whole new challenge. It isn't necessarily a bad thing if you like tough puzzles. The Marine Series are a fantastic addition to the Cast collection. They follow Hanayama's excellent presentation standards and philosophy and for a collector's point of view, a must have (all of them). The actual puzzle concept is not new, but it's its design approach that makes all the difference between an ordinary puzzle and a brilliant puzzle. The Cast Seahorse can be bought at PuzzleMaster, as well as all other Cast Puzzles. Note: In previous reviews, I had as the Cast Puzzle's official website, the English version, but apparently this site has been down for a few weeks now, and I'm not sure if it will return. 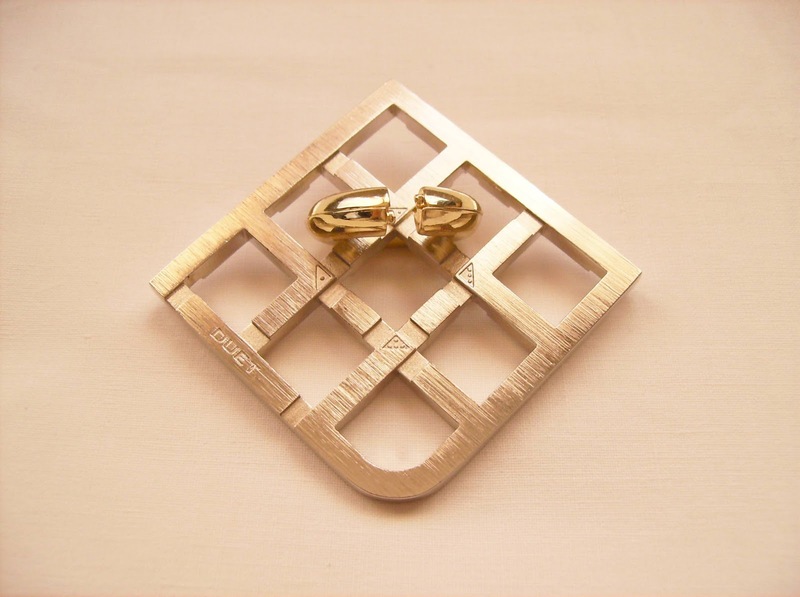 For now, I will only list the Hanayama's website, which unfortunately is in Japanese only. The Destroyer is designed and produced by PuzzleMaster. There's a wide variety of these puzzles, all made by PuzzleMaster and you can find them here. Wire disentanglement puzzles date back from a couple of centuries ago, and back then were recognized as some kind of magic tricks, because of the steps required to separate them. 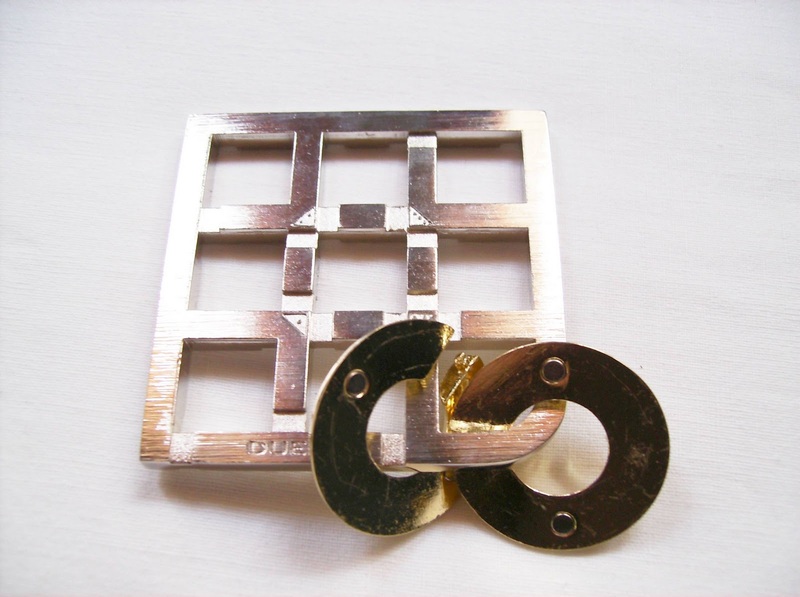 This type of mechanical puzzles are also among the most difficult ones to solve, mostly because of their design, which is always different for each one. This implicates that whichever puzzle you solve, you won't gain much experience for solving a completely different one. Over these couple of centuries, thousands of different designs have been made, which fall into several categories. You can see a comprehensive guide on these puzzles at Robb's Puzzle Page. The goal of The Destroyer is somewhat easy to comprehend, compared to other designs. 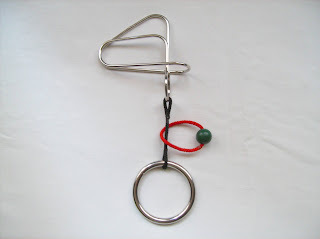 There's a red string with a green bead attached and you need to remove them from the puzzle. The puzzle is rated by PuzzleMaster at 9 out of 10, which is pretty difficult, but I found it much easier than I was expecting it to be (around 10 minutes to solve)... You just have to look at it with a different approach, much like any other wire puzzle, for that matter. At first glance, when you try to work out how to remove the string, it looks like the only possible way is to pass it around the big ring. It's an impossible task though, because the red string is smaller than the diameter of the ring. The correct method to get the string out, is actually through the bottom part of the 4-shaped frame, but since you have that black string with the ring blocking your way, you need to shift it to another part of the frame, leaving open space to finally remove the red string. You'll need to pass the ring through the frame in order to make the black string able to move freely around the wire. To get the red string back on its original position, just repeat the same steps backwards. I was pleasantly surprised by the clever design of The Destroyer. I was able to solve it in a fairly amount of time, probably in a lucky move, but I bet there'll be others that will struggle to see the solution so easily, because after all, this is a level 9 puzzle. While Wire Puzzles aren't among my favorite type of mechanical puzzles, they do provide a serious level of challenge and creative thinking. I recommend it for anyone that likes to think outside of the box. 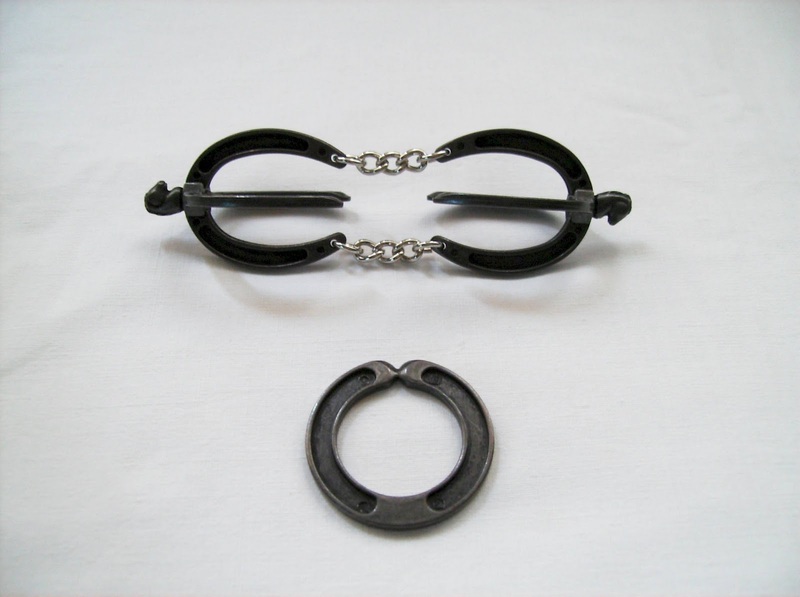 The Destroyer is available at PuzzleMaster, along with many other great wire puzzles.